Blaine County, Oklahoma, about 45 miles (72 km) northwest of Oklahoma City. Two groups of Mennonites settled here. The Pleasant View Mennonite Church (Mennonite Church) of the South Central Mennonite Conference in the southwestern part of the county was organized in 1898. In 1950 there were 15 families living here and 20 families in Custer County adjoining Blaine on the west. In the southeastern part of Blaine County a group of General Conference Mennonites settled at Geary in 1892. Several years later they organized the Geary Mennonite Church, which had 40 members in 1950 living in Blaine County and 76 living in Canadian and Kingfisher counties east of Blaine. Kaufman, Waldo W. "Blaine County (Oklahoma, USA)." Global Anabaptist Mennonite Encyclopedia Online. 1953. Web. 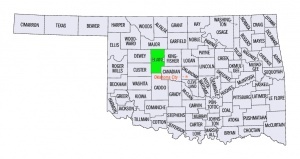 22 Apr 2019. http://gameo.org/index.php?title=Blaine_County_(Oklahoma,_USA)&oldid=91137. Kaufman, Waldo W. (1953). Blaine County (Oklahoma, USA). Global Anabaptist Mennonite Encyclopedia Online. Retrieved 22 April 2019, from http://gameo.org/index.php?title=Blaine_County_(Oklahoma,_USA)&oldid=91137.